Breeding Cairn Terrier Female Cereza - ZAUBERBERG! Breeding Cairn Terrier Female Cereza was imported from Poland. She is a larger sized female that has extreme typical brindle wire coat with black markings. Her temperament is very solid around anybody. She has a very playful disposition with toys. Easily trainable as she is super observant and smart. She has been an outstanding mother to our puppies. 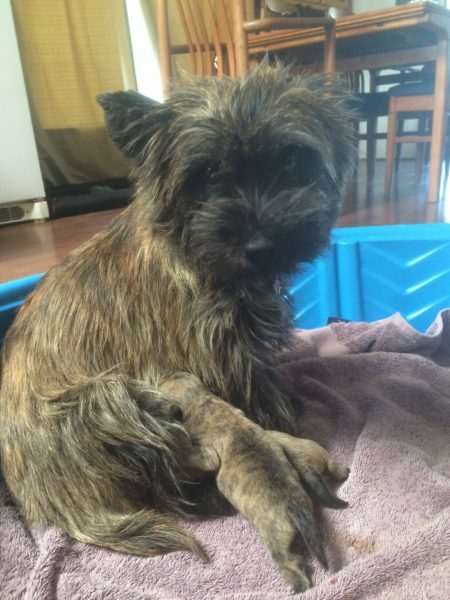 Interested in a Cairn Terrier Puppy vom Zauberberg?